For our second day in Portland, we decided to head in the other direction, through the Columbia River Gorge and to Mount Hood for another hike. We grabbed breakfast at Mugshots Cafe again, and set out! Our first stop was the viewpoint at Portland Women's Forum, then a pitstop at Multnomah Falls (very crowded, even at 10am on a Friday!). I was interested in seeing the Oneonta Falls, but the super cold weather combined with the need to wade through water to get there made it a pass for us. I also read it was very busy there as well. Multnomah Falls - a pretty good waterfall. After this, we drove to Hood River and picked up a sandwich to go from River Daze Cafe (Yelp, Website). Then we headed down through the Fruit Loop towards Mount Hood for another hike! Cory selected the Owl Point from Vista Ridge Hike, which wasn't too difficult, and about 3 hours. 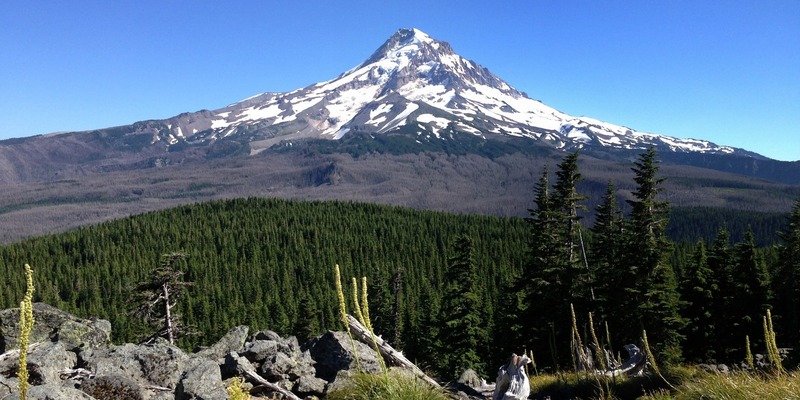 The views of Mount Hood at the end promised to be jaw-dropping! It took us a while to find the trail head parking area though. Our phone signal was not great out there, so we drove around for a while to find it. This is what the trail towards the trailhead looks like. If you see this, you're in the right place, don't worry! The official trail head! Yay! One of the first view points is of a rock pile. We would end up over there later. The trail is not too strenuous, in that you head upwards at the start and then walk along the vista. I like the varied scenery. Fast forward about 2 hours later, we made it to Owl Point! Time to see that epic view!!! Oh well. We consoled ourselves with our River Daze Cafe turkey sandwich, and HOLY MOLY was it epic. I don't know if it was the workout or the sandwich itself, but this was the most memorable sandwich we've ever had in our lives. There were hot peppers and pickles, raw red onions, lots of real turkey breast, mayo and cheese. Oh man, it was amazing. We headed up to the Rockpile to take a look. Still no Mount Hood. I thought we'd have a chocolate snack and see if maybe the clouds would clear up. They didn't. What seemed like an eternity later, we finally got back to the parking area! Amazing! We don't usually go hiking on back-to-back days, so I was pretty knackered by the end of this one. I have really flat feet, and my knees and this weird part between my hips and my thigh were really hurting at the end of this. We hopped into the car and took our long two hour ride back to Portland. We were starving and had dinner at a restaurant near our hotel, which unfortunately had a 45 minute wait (argh, Friday nights!). Though, they were nice enough to call us when we were up, so we actually went back to our hotel and laid on the bed. Then we ran to the restaurant when we got called, and they were actually really fast at bringing our dishes, so we were back at our hotel within 30 minutes!